BARCELONA—If Apple’s CarPlay and Google’s Android Auto are two hares racing to connect their smartphones to your car, MirrorLink is the tortoise, slowly and patiently working its way to the finish line. That tortoise gained two important allies on Wednesday at Mobile World Congress: The HTC One M9 and Samsung Galaxy S6, high-profile flagship smartphones announced at the show, will both support the platform-agnostic car-phone interface. All normal people care about and want, of course, is to be able to plug their phone into their car and enjoy their infotainment and navigation apps. They could do it through the phone alone, but MirrorLink (and Android Auto and Apple CarPlay) aim to make it safer by building better interfaces than the car companies can. To compete in this race, three elements must play well together: The cars, the phones, and the software to go between them. MirrorLink now has several major automakers and major phones on its side. It also has a small group of apps being developed, including the BringGo navigation app and the Parkopedia parking app. 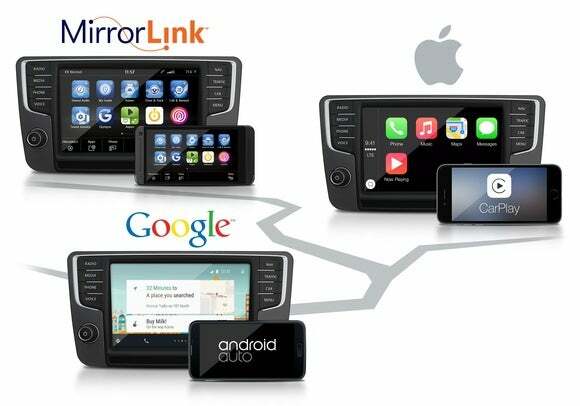 What this means for you: MirrorLink, developed by the nonprofit Car Connectivity Consortium, lacks the marketing clout of CarPlay and Android Auto. The support of highly visible phones like the HTC One M9 and Samsung Galaxy S6 validate it as an alternative—especially to Android Auto, of course, as all the compatible phones so far run Android. The main reason anyone should care about MirrorLink is that it doesn’t tie you down. Android Auto and Apple CarPlay are trying to commit you to an ecosystem, while the Car wants to make it safer for you to use whatever phone you have in your car. MirrorLink gives you an alternative to in-car infortainment systems, many of which pale in comparison to how smartphones can handle all the same data. On the software/app side, the Car Connectivity Consortium gives developers the tools to create good apps for MirrorLink, but it doesn’t impose all the boundaries and rules that Apple and Google do. The phone side is a bit trickier: Only specific phones support MirrorLink, although the list is growing. Don’t expect the iPhone to be there. Apple CarPlay is gradually adding more car support. Android Auto is almost here. MirrorLink is the scrappy car-smartphone alternative, and it’ll be important to watch all three as they jockey for advantage in this arduous race.